My husband's grandfather used to sing a little song about how he wished he was a little bar of soap, "I'd go slippy, slippy, slidey - over everybody's hiney, Oh, I wish I was a little bar of soap!" Well, if I could be made fresh, from amazing ingredients and pure essential oils like the soaps at Naked Bar Soap Company, maybe I'd want to be a little bar of soap, too. 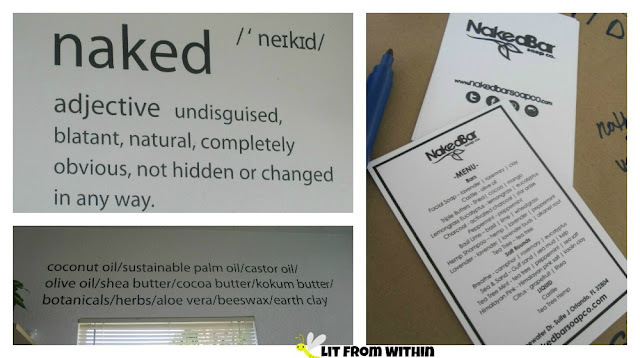 The Naked Bar Soap Company is so named because their artisan soaps are made with natural, recognizable ingredients and scented only with essential oils - no synthetic fragrances. 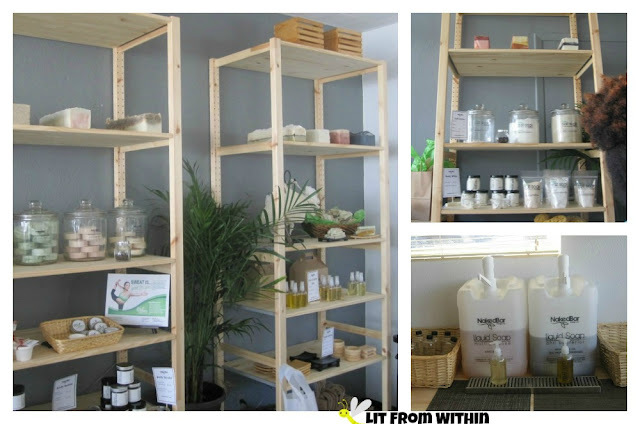 The shop is small, but full of so many different varieties of soap - from liquid soaps to salt bars, even cupcake-shaped soaps! They also make a natural deodorant called, "Pit Cream" and make body scrubs and lotions, too. I couldn't resist buying their Hemp Shampoo Bar and a Salt bar to try. I've never seen solid shampoo before! Some of the many varieties of soaps, and the Hemp Shampoo Bar (L) and Citrus Salt Bar (R, with the orange center) that I ended up purchasing to try. If you're interested in more than what's available in their shop, and you can make it over to Orlando, FL, you can sign up to attend one of their "BYOB" - Blend Your Own Bar - soap blending experience. I was invited to share in this experience, through the Beauty Bloggers of Central Florida, and it was pretty amazing! Rather than making soap from scratch, which takes more expertise than can be taught in the session, the Naked Bar provides a pre-made soap base, to which I could add a number of dry ingredients and an essential oil for scent. 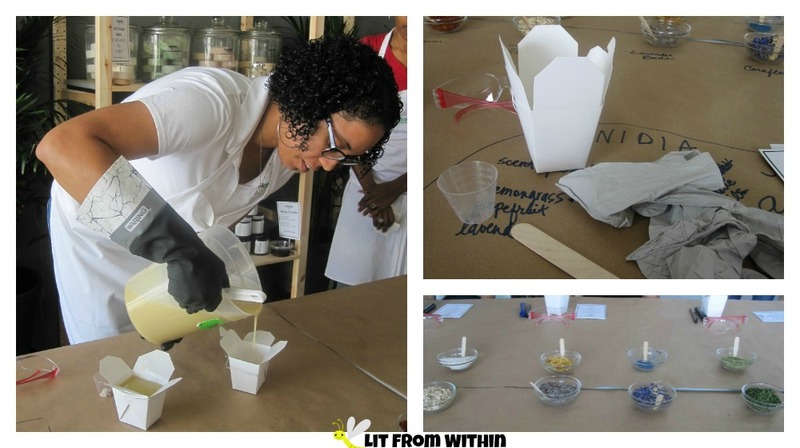 We were provided with a sample of different ingredients, and talked about what each ingredient's properties were, and how they would look inside or on top of the soap. Some, like spinach powder, are mainly used for coloring. Other, like Calendula, or Lavender, are used for their soothing and healing properties. I chose Blue French Clay, some of which I mixed in, and then a little swirled on top. I also mixed in Cornflower and Calendula petals. Isn't it cool? The hardest part about making the soap, aside from choosing ingredients, is the wait! It takes about 6 weeks for the soap to cure. The base is chemically changing, and water evaporates during that time so that it becomes soap. I have about 5 more weeks before I can try my hand-blended soap.. another reason why I couldn't leave without buying some soap! Even if you don't live in Central Florida, you can still try some of the amazing artisanal soaps from The Naked Bar. Currently, they only ship in the US, though. Not only are their soaps lovely to look at and delightful to smell, they are made with the best, natural, sustainable ingredients. They also partner with Pretty On Purpose, a non-profit that encourages girls from under-served communities to explore science, technology, engineering, and math. For more information, or to purchase from The Naked Bar Soap Co., they can be found on Facebook, Twitter, Instagram, Pinterest, and their website, where soaps range in price from $7.50 to $10 a bar, and they carry an assortment of bath and body products, too. Do you wish you had a bar of Naked soap?